There’s definitely been a sense that Vince Vaughn settled into his comfort zone too early, the once promising actor making a career out of middling comedy vehicles (with a few strong successes in there to be fair) that utilised his sardonic wit, if not his acting chops to any great degree. If the past couple of years are anything to go by he’s setting out to change that, taking on small supporting roles in serious dramas such as ‘Hacksaw Ridge’ and making a foray into television with the second season of ‘True Detective’ (albeit his performance and the season as a whole were not generally well received). 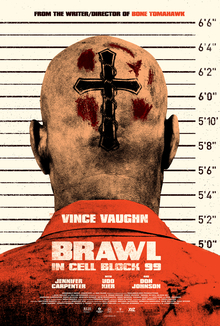 ‘Brawl in Cell Block 99’ is his latest venture, a grindhouse style exploitation thriller where he plays a shaven headed tough guy forced into a spiral of violence to protect his family. ‘Brawl in Cell Block 99’ comes from S. Craig Zahler who helmed last year’s ‘Bone Tomahawk’, a visceral, brutally violent western that was a delight thanks to a terrific ensemble and great characterisation. His follow up is more of a one man band although there are fun turns from the likes of Fred Melamed and Don Johnson as a sadistic prison warden, and to be honest that’s no bad thing. This feels like a role made for Vaughn at this stage in his career, with his hulking figure and shaven head given off a menacing threat and boy does he deliver on that with some bone crunching sequences that are certainly not for the faint hearted. The film takes its time before getting to the brawl of the title or indeed the prison, building a narrative that outlines the kind of man Bradley Thomas is and what matters to him in his life, delivering some stakes to the violence that will soon follow. The plot itself is nothing to write home about but Vaughn and Zahler keep you entertained and the bursts of violence are well choreographed and directed when they come. ‘Brawl in Cell Block 99’ is an entertaining, brutally violent B-movie led by the best Vince Vaughn performance in years, and whilst it may not be ‘Bone Tomahawk’, I enjoyed it as a ‘turn your brain off and enjoy’ kind of movie.